After the lengthy journey from Groningen to Gothenburg the previous day, our first full day in Sweden began with a mercifully late morning. As our only organ activity was taking place at noon, we were able to sleep in late and forage for breakfast/lunch to our satisfaction. My first order of business for the day was to find a coffee shop with working wifi, since Chris Porter and I unfortunately discovered that we could not get on the internet at our apartment last night. Looking out over the rooftops of Gothenburg. My stroll toward the center of the city was peaceful and leisurely. Weather was excellent with sunshine and an agreeable temperature of 70-something Fahrenheit. 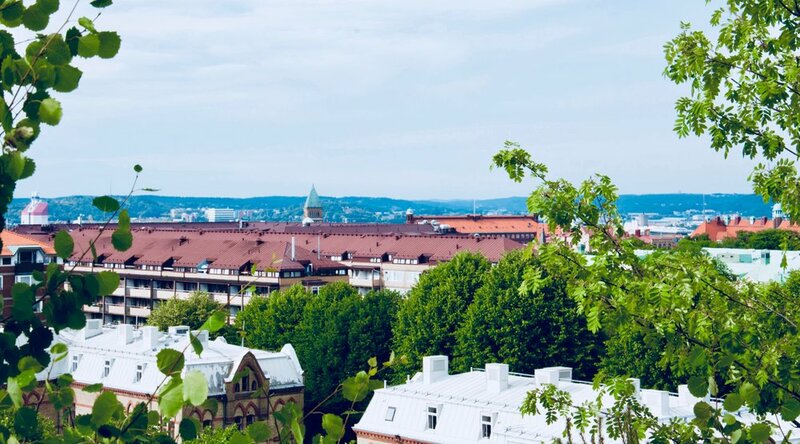 Out in the residential areas of Gothenburg on a Saturday morning, you didn't get the sense that you were walking around Sweden's second largest city, home to 580,000 people. Things became livelier as I entered the shopping district, with many open stores and even a small outdoors clothing sale in a square. Large crowds sporting the Swedish blue and yellow were also visible. Excitement was in the air, as the home team fans eagerly anticipated the upcoming friendly match between Sweden and Peru taking place right in Gothenburg later in the day. As for myself, I was excited to find a coffee shop in quick order, and I scarfed down a croissant, checked my email, and drank a cup of coffee before our appointment. Our noon visit to Gothenburg Cathedral, or Göteborgs domkyrka, began with an organ recital by Hans Davidsson, who we will have the chance to work with more in the coming days. Hans' program was constructed around the themes of Ascension and Pentecost. The recital began with a performance of Bach's Prelude and Fugue in E-flat major (BWV 552). The "St. Anne", as BWV 552 is also known, serves as bookends for the Clavier-Übung III which is referred to as the German Organ Mass. 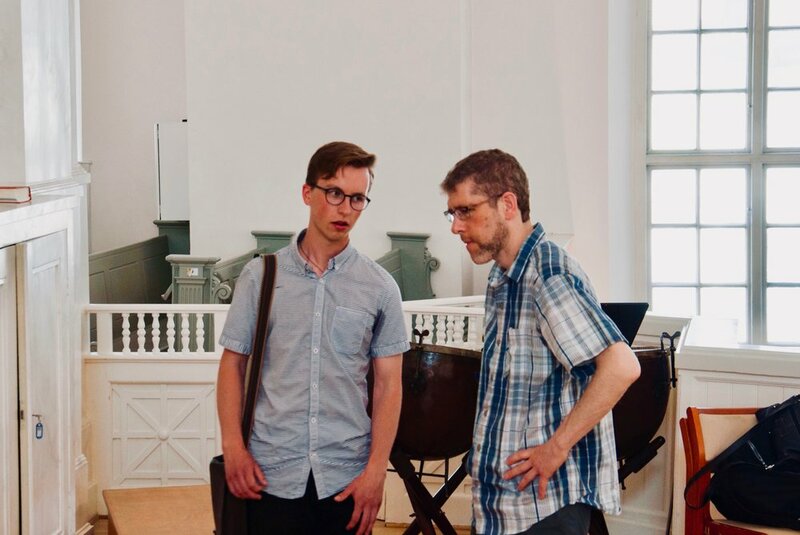 For his program, Hans chose to interpolate the prelude and fugue with the chorale "Schmücke dich, o liebe Seele" (BWV 654). Also written in E flat major, the chorale is a jubilant exhortation for the soul to enter into heaven. The text pointed the audience towards an uplifting interpretation of the prelude and fugue on either side of the chorale, consistent with the theme of the program. The next two composers made for a striking contrast against the Bach portion of the program: Nilsson & Messiaen. Torsten Nilsson's Cage-esque Improvisations made use of tone clusters, extremely staccato articulations, tones and chords, dynamic changes using the swell box, and many more effects. The overall sonic impression of the piece was disorienting, with the sound seeming to come from different corners of the space. 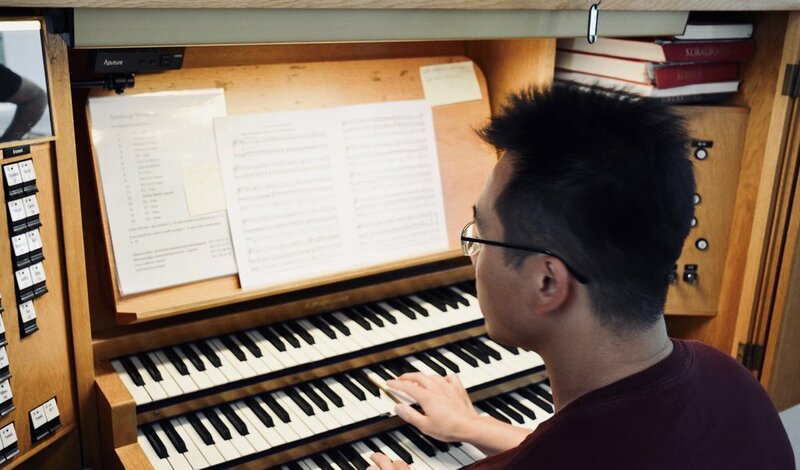 Combined with Messiaen's pieces, "Communion" from the Pentecost Mass and L'Ascension (complete), the second half of the program showed off the versatility of the organ to perform very different styles of music. 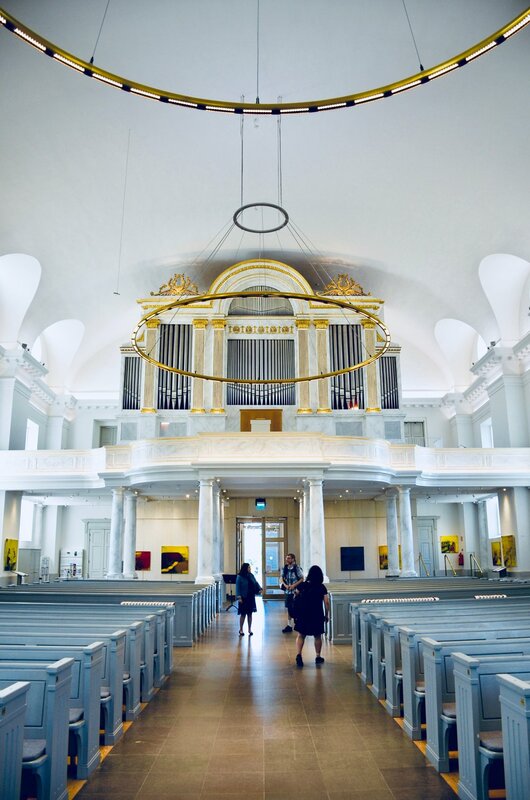 The Magnusson organ in Domkyrka is an important instrument in Gothenburg and a good example of a mid-20th century, neo-Baroque style organ, equipped with a mechanical key actuon and a swell box. As Hans' program demonstrated, it is a flexible instrument capable of pulling off a variety of styles. The organ boasted an eclectic array of stops. Particularly, it possessed some interesting mutations and mixtures: a mixture with 1 and 1/7th (minor 7th interval), a mixture with a minor 3rd harmonic, and even a 16/19th! As Chris L. pointed out, the instrument was all about the harmonics and less so the fundamentals. Adrian Cho at the console of the Magnusson organ, Gothenburg Cathedral. It was then time to try the organ out for ourselves. Corey's "Nun danket alle Gott" by Karg-Elert appeared to work well here. Jennifer played "O Mensch, bewein dein Sünde groß" (BWV 622) by Bach using a lovely combination of flutes on the great and pedals and tremulant cornet compose on the swell division. I tried my hand at playing some of Carson Cooman's "Three Autumn Sketches after a Watercolor by Maria Willscher". I missed not having any string-type sounds but Corey helped me make it work with the available colors. With our official business concluded relatively early in the day, we were free to spend the rest of the time as we pleased. We unanimously voted to take a group lunch at a restaurant recommended by our Airbnb host, which lasted until 5 pm. After lunch, Jennifer and I decided to take a walk around the town, hoping to find some interesting adventure as we did in Hamburg. Unfortunately, almost everything was closed by 5 pm on Saturday, so we were unable to find much to do. We were particularly disappointed that we didn't find the origin point of a number of pedal boats in the river that we observed earlier in the day. Chelsea Keating and Christian Lane in the garden of our Airbnb. Evening brought with it something far brighter than the darkness of night — our fellow organist and friend Laura! We celebrated her arrival from Boston with a delicious barbecue (much credit to Chris P.) including plenty of chicken, corn, sausage, wine, and friendly conversation. Our appetite for food and camaraderie sated, we settled into bed under the permanent and weird glow of Nordic summer twilight. View over Goteborg from near our Airbnb. The Magnusson organ in Göteborg Cathedral. The façade of the Magnusson organ in Göteborg Cathedral. Christian Lane demonstrates the Magnusson organ in Göteborg Cathedral. 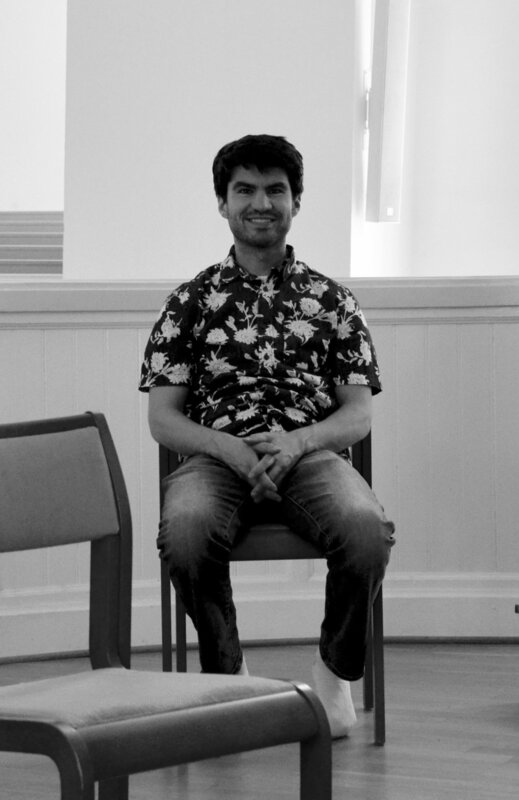 Chris Porter speaks with Arno Humal, current organ student at Göteborg University. Chris Porter plays the organ in Göteborg Cathedral, while Corey De Tar looks on. 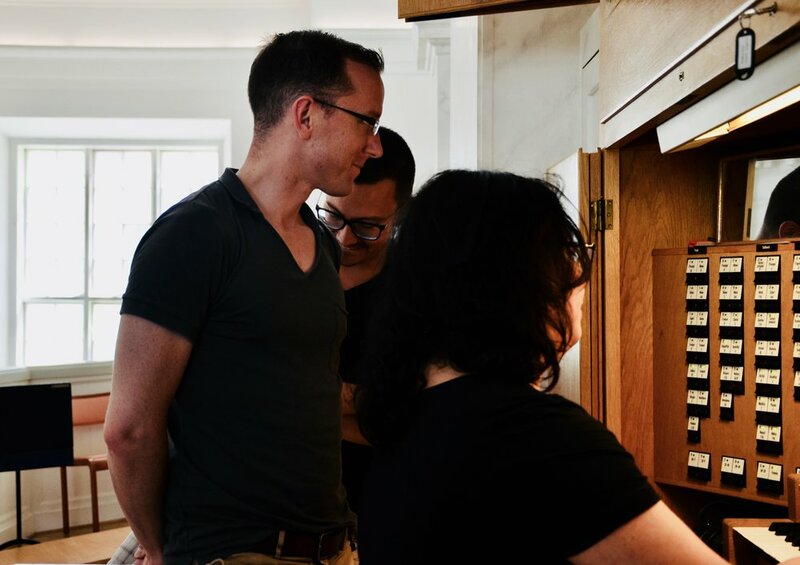 Jennifer Hsiao plays the Magnusson organ in Göteborg Cathedral, while Christian Lane looks on. Corey De Tar and Chelsea Keating in Göteborg Cathedral. Adrian Cho plays the Magnusson organ in Göteborg Cathedral. 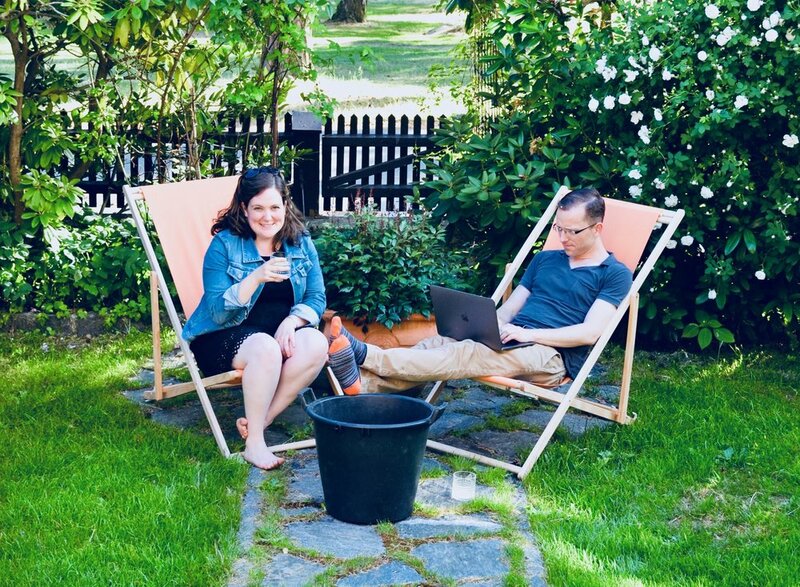 Chelsea Keating and Christian Lane enjoy amazing weather at our Airbnb in Göteborg.